Robin Powell was one of the lovely ladies at my natural plant dye course at the Sydney Botanic Gardens earlier in the year and here is an article she wrote for the Sydney Morning Herald about what she got out of the two day course. Below is the online version of the article. When I was a child I spent hours making potions and perfumes from the pickings in my mum's garden. The purple fingers of flowers that waved at me from a huge old buddleia were highly sought after, but what I didn't know then is that buddleia has a secret side for the potion-maker. When heated, those purple flowers produce a dye as saffron-yellow as turmeric. 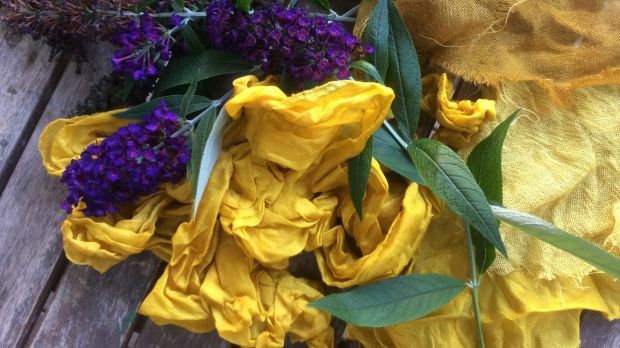 This astonishing metamorphosis was the most surprising finding of a weekend spent experimenting with eco-dyeing; and reliving my childhood as a garden witch/perfumier. 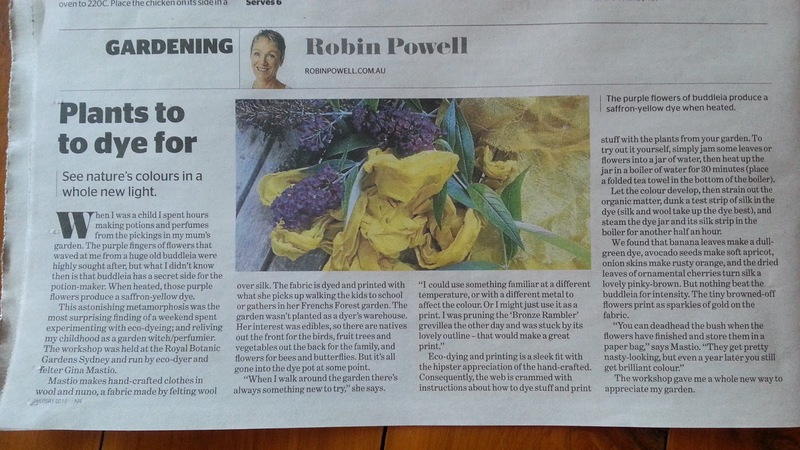 The workshop was held at the Royal Botanic Gardens Sydney and run by eco-dyer and felter Gina Mastio. Mastio makes hand-crafted clothes in wool and nunio, a fabric made by felting wool over silk. The fabric is dyed and printed with what she picks up walking the kids to school or gathers in her Frenchs Forest garden. The garden wasn't planted as a dyer's warehouse. Her interest was edibles, so there are natives out the front for the birds, fruit trees and vegetables out the back for the family, and flowers for bees and butterflies. But it's all gone into the dye pot at some point. "When I walk around the garden there's always something new to try," she says. "I could use something familiar at a different temperature, or with a different metal to affect the colour. Or I might just use it as a print. I was pruning the 'Bronze Rambler' grevillea the other day and was stuck by its lovely outline – that would make a great print." Eco-dying and printing is a sleek fit with the hipster appreciation of the hand-crafted; consequently the web is crammed with instructions about how to dye stuff and print stuff with the plants from your garden. To try out it yourself, simply jam some leaves or flowers into a jar of water, and heat up the jar in a boiler of water for 30 minutes (place a folded tea towel in the bottom of the boiler as you would it you were sterilising jars). Let the colour develop, then strain out the organic matter, dunk a test strip of silk in the dye (silk and wool take up the dye best) and steam the dye jar and its silk strip in the boiler for another half an hour. 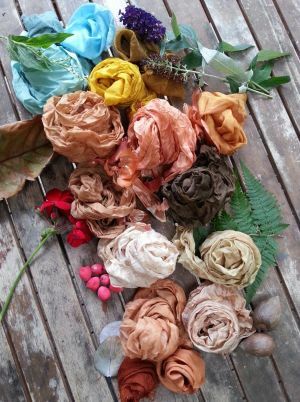 We found that banana leaves make a dull green dye, avocado seeds make soft apricot, onion skins make rusty orange, and the dried leaves of ornamental cherries turn silk a lovely pinky-brown. But nothing beat the buddleia for intensity. The tiny browned-off flowers print as sparkles of gold on the fabric. "You can deadhead the bush when the flowers have finished and store them in a paper bag," says Mastio. "They get pretty nasty-looking, but even a year later you still get brilliant colour." The workshop gave me a whole new way to appreciate my garden – as craft cupboard, and not just for the kids and their potions.